Karl tells Alex he is doing well, considering, as the kids come out and say they are heading off. Susan thought they could spend the morning together, but Alex says they should get on with what they have to do. They leave and Karl wants to discuss Palliative Care with Alex, but Alex and Susan want to hold out at home as long as possible. Max posts a Christmas present to Bobby, telling Summer he may be a pain in the…rear…but he's still his Dad. Summer says hi to Rachel and Zeke but they ignore her, and Max tells her to be patient. Rachel orders 2 MET tickets, but Zeke is still struggling to understand why she wants to find Katya. Rachel replies Katya is all they have. She's been spotted at the Stanning Rehabilitation Clinic, but the nurses there can't help because she appears to have changed her name. Rachel is adamant that they will find her and be a family, even though Zeke is hesitant. Rachel gives Sum and Bree the 411, and they want to help, but Rachel tells them it is family business. All she wants them to do is cover for them. Summer and Bree eventually agree, and Rachel leaves. Zeke hangs back and says Rachel is acting out of character, but they hope if they find Katya, it will cheer Alex up and they will be a family. Bree reminds him it might make things worse. Zeke leaves and Summer comments to Bree that she doesn't like this. Elle is helping Ned practise his script, and says his reading isn't as bad as he thinks – she only has to help him with a couple of words. Ned says his biggest hurdle is his confidence, and Gino's script – they have a laugh about Gino and his ‘vision' before Ned thanks Elle for her help. Elle says it is fine, but they have to take a Chrissie break – Gail wants her in Tassie for Christmas, so she has to choose. Ned says he isn't looking forward to going home, because his father expects him to take over the farm. Gino arrives and asks Elle to stay and help. Bree sends Summer into her room to get chocolate, and answers the door. It's Susan after Rachel and Zeke. Summer listens in as Bree tells Susan the kids went shopping with Max and Summer. She says Max will get them lunch and drop them off at the wedding rehearsal. Susan thinks it's a bit short notice, but Bree says that's the Kinski's – ‘getting crazier everyday!' Susan leaves, but Summer looks uneasy. She thinks maybe they should have told Susan, but Bree doesn't think they should break their promise. The nurse refuses to help Rachel and Zeke, as she can't give out patient information. Zeke gives her their address and says to get in touch if she can help. The nurse walks off, but Rachel tells Zeke they aren't leaving. Zeke doesn't see what else they can do, but Rachel starts to yell ‘Katya! KATYA!' at the top of her lungs. The nurse calls out for some help from another nurse, Cathy. As Cathy emerges, Rachel stops yelling – it's Katya! The nurse asks if she knows them, and Katya replies that it's her little brother and sister. Susan and Alex walk along, discussing flowers and things for the wedding. Alex jokes maybe they can tuck the ambulance behind the bushes over there, and Susan marvels at how he can keep laughing through everything. Max comes over and is greeted by…well, it's Susan's *voice* I hear, but her lips don't actually move! They ask if Max has dropped Rachel and Zeke home, but Max is all ‘who with the what what now?' He says someone's wires have been crossed, the last he saw of the kids they were headed out of Ramsay street on foot. Alex is having trouble breathing so they help him home. Katya tells Zeke and Rachel how grown up they look…well, it has been 6 years, Rachel laments. They tell her that Alex is getting married, and they would really like it if she could come home for a bit and meet Susan and see Alex. Katya says she can't…she has to get back to her rounds and she just…can't. They tell her about Alex's AIL, and Katya looks a bit shocked, but tells them she is sorry he's not well, but she can't come back with them. RACHEL (to Zeke): She's our family, whether she likes it or not. We're not going anywhere without her. Karl tells Alex it isn't good, and he is going to ring the Palliative Care unit. Again, Alex insists he stay with Susan and the kids. Alex wants to know where the kids are, but Susan doesn't want to leave him. Karl agrees to help them out. Max is trying to get Summer and Bree to tell him if they know where Rachel and Zeke are. He can't believe Rachel asked them to cover, but didn't tell them where they were going. Karl comes in and pleads with the girls – Alex is dying and Rachel and Zeke need to come home. Summer tells him they are at Stanning Rehabilitation Clinic, but Bree insists they don't know anything else when he asks why. Rachel and Zeke are sitting outside the clinic, when Karl comes running around the corner. He tells them they have to come straight away, Alex needs them, but Rachel is stubborn and refuses. Katya listens from around the corner as Rachel yells that she isn't leaving without Katya – family is more important than ever now. Zeke says Katya can't help Alex anymore. Rachel says that if he sees her it will give him hope. Karl stresses that Alex needs them now, and Rachel reluctantly leaves, but not before Karl catches sight of Katya behind the tree. Susan thanks Karl and hangs up the phone, returning to Alex who is in a lot of pain. She is upset that she is losing him before her eyes, but he says that he is leaving his kids with the best mother he could ask for for them. Alex tells Susan to call the priest. Susan panics, but he tells her it's so they can get married - -a Belarusian tradition – happiness amongst tragedy. 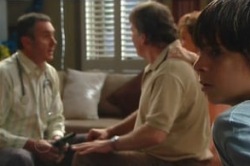 Karl and Susan watch on as Alex talks to Rachel and Zeke, asking them to always remember how much he will always love them. He says they have brought him joy every day and given his life meaning. Zeke hugs his Dad, as Alex tells them he wants them to always be there for each other. They promise and he tells them how proud of them he is…Katya too, wherever she is. The kids exchange a glance and Alex asks if they found her, but Zeke says she wasn't there. Karl heads off and Susan thanks him for what he did. As Karl leaves the house, Katya is sitting in her car outside. Karl greets her, but she has no idea who he is. He says he is Alex doctor, and Alex may not last the night. Katya says she has no business being here, but Karl tells her if she doesn't say goodbye, she'll regret it forever. Alex is showing Zeke how to do his tie, while Susan finally finds a priest who can marry them. Susan supposes she should get ready, and go over to the Hoyland's to get her witnesses, and ring her kids too, but Alex assures her there is plenty of time. Zeke proudly shows them his tie, which is a bit like a dog's breakfast. ALEX: You look terrible, mate, but it'll do just fine. There's a knock at the door, and Susan goes to answer it. When Katya tells her who she is, Susan is so relieved she has come. She walks into the room, and spots Alex. Gino is rehearsing the play with Ned, and with Elle playing the female lead. The scene they are rehearsing is a blatant parallel of what has been going on between Ned and Elle since she arrived in Erinsborough. After they recite the lines to each other, Gino tells them to kiss. Ned is hesitant at first but Gino is appalled. ELLE: Kiss me…Are you really better off Ned? He closes the millimetre of gap between them and kisses her. Gino revels in the romance! The drama of it all! The…hold on a second…they're still kissing…Are you thinking what I'm thinking, Gino…? 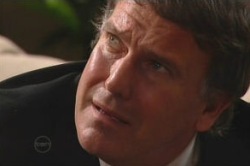 Zeke apologises for lying about not finding Katya, before Susan escorts them from the room. Alex tells her he is glad to see her, but she reminds him that's not what he said last time. Alex apologises and says he has been sorry for a long time. Katya says Karl told her about the AIL, and she knows what's going on because she is a nurse now. Alex tries to tell her he is proud of her, but she says her name is Catherine Sangmu now. Alex says there hasn't been a day in the last 6 years where he hasn't wished their circumstances were otherwise. Alex tries to explain, but Katya can't go further than the fact he threw her out. And he never even tried to find her. Now he wants her to apologise – well, she can't!